Trying to keep track of press coverage of the WMOR during and after the march. Attendance estimates are now up to 40,000 based on people studying and estimating based on pictures of the actual march. At Moore Square, see NOW sign on right. Photo Credit: Maggie McGee. 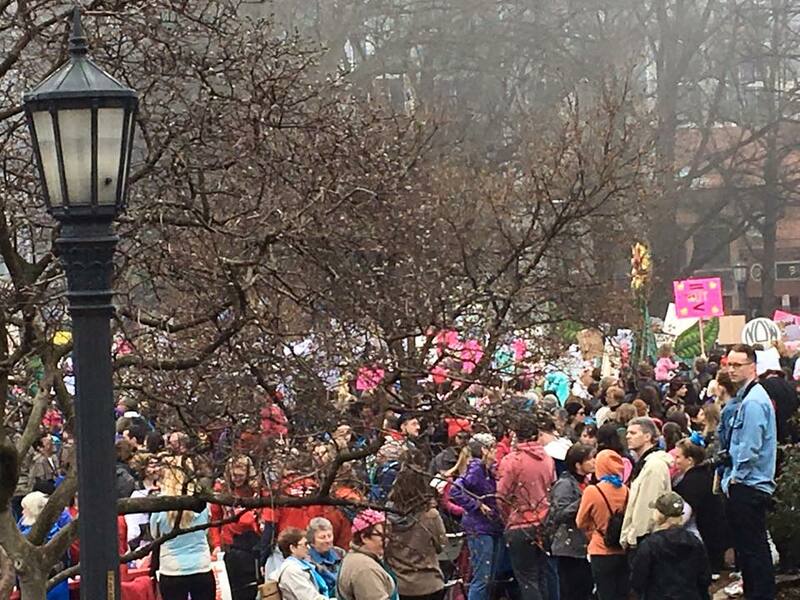 Thanks to Sarah Moncelle for putting this together at https://womensmarchonraleigh.org/press/. Day of the march, January 21, 2017, with women’s marches across the nation completely transfixing the news and media! This article includes quotes from many of the speakers in our rally program, including Nia Wilson from Spirit House, Allison Coffman from Carolina Abortion Fund, and MaryBe McMillan from AFL-CIO, among others. Day after the march, January 22, 2017 – the estimates have increased to a minimum of 25,000, and possibly 40,000 people! A continuous wall of marchers streamed from Memorial Auditorium to Moore Square for 1.5 hours. Aerials from the Marriott and Moore Square parking decks are quite revealing. This entry was posted in birth control, children, economic justice, immigration, jobs, minimum wage, Misogyny, pro-choice, public education, racial justice, reproductive rights, safety for women, violence against women and tagged abortion, children, education, health, social justice, violence against women, women. Bookmark the permalink.